Despite so many restaurants around Penang that can cater for ala carte menus as well as to hold banquet functions, there emerged another one right in the heart of Georgetown, Penang. 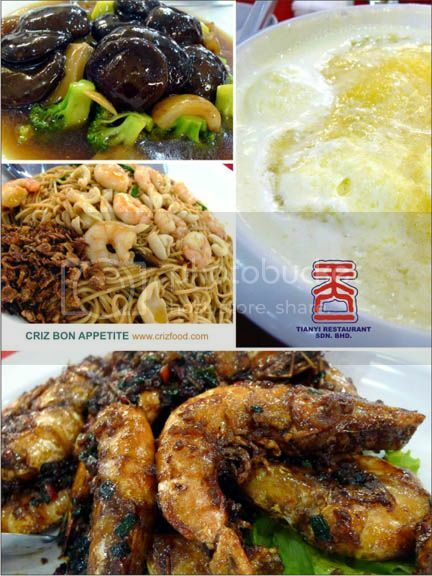 Barely in business for two months and located within the compound of the Loh Si Tong Chong Seah, is a newly opened restaurant by the name of Tianyi Restaurant. 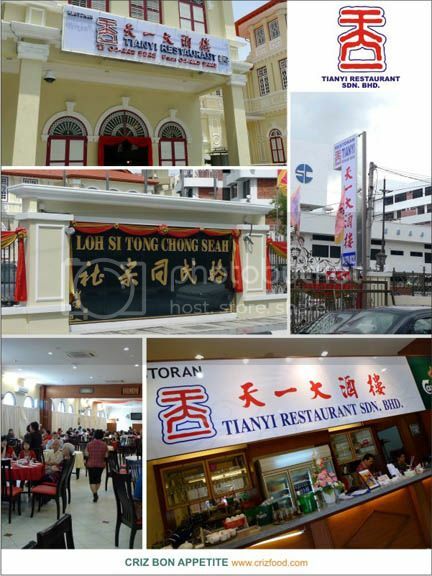 The heritage style building can cater up to 50 tables (about 500 pax) at one time. On top of the 8-course meal (RM388 nett, RM438 nett and RM588 nett) and the ala carte menus, you can even order a simple meal of fried rice, noodles or roasted chicken/pork rice (RM10 and above from the stall at the entrance). Since it was a birthday function with a few dozens of celebrators, we opted for the most expensive of the 8-course lunch meal at RM588 nett. Let’s judge how long this new establishment would excel in catering to the needs and taste of its patrons. The first dish that arrived was as usual the starter as what any wedding banquet would have or many more. It was the Five Hot & Cold Combination (五福喜臨門). It had a cold salad and four hot dishes. There was the Stir Fry Mixed Vegetables with Fresh Scallops & Chinese Crullers (油條/youtiao). This was rather nice as there was the freshness of the scallops and the slight crunch from the water chestnuts and Chinese crullers. The next dish was the Deep Fried Sea Cucumber with Black Pepper. It had the right combination of flavor except that it would not be suitable for children with the overpowering black pepper usage. I was hoping that the Cold Jelly Fish Salad would not fall short to my expectation but indeed it was the only item left on most of the plates on each table as majority of the senior citizens detested the hotness and sourness of the dish. The Prawn Dumplings has the beauty of Snow White but the taste of flavored water. They were totally bland. Even the gravy was almost colorless. Luckily the Breaded Meat Balls saved the day as it had the nice crisp from the rolled bread cubes over the juicy meatballs. The next course was the Shark’s Fin Soup with Special Eight Treasures (八珍燴生翅). For one thing, I don’t think real sharks fin would be used nowadays due to the strong protest worldwide against the killing of sharks for their fins. Anyway, those served here did not taste real. The soup was done quite well considering that it had a strong hint of Angelica sinensis (當歸/dong quai) in rich stock. The only problem I had was to identify the 8 treasures. Out of the 3 bowls I had taken to hunt for the “treasures”, I could only manage to detect a strong trace of dried scallops, crab meat, prawns, mushrooms and of course the mock sharks fin. Although the taste was superb, this dish lacked the value as the one I had taken from Starview Restaurant which was fully filled with ingredients. 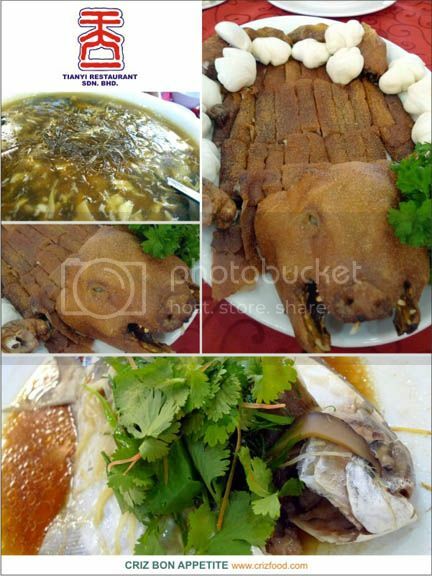 We also had the Roasted Whole Suckling Pig (出骨南乳豬). The piglet was not really well prepared as the skin could really be tough for weaker teeth and the meat was not as tender and flavorful as I would have expected. Starview Restaurant still remains my best choice for this dish after numerous try out at other restaurants. Steamed Chinese Pomfret Fish in Hong Kong Style (港式蒸斗底) was served next. You would never go wrong with steamed fishes unless your over steamed it. Fortunately, the restaurant did a great job in getting the right texture for the priced fish. The only few preferences that I like would be the addition of some deep fried chopped garlic and a dash of Shaoxing wine. Sliced young ginger is quite irrelevant if you have fresh fish such as at my most recommended restaurant in Penang, Chin Bee Tea Café. Moreover, you can really taste the differences in the quality of soy sauce used at Chin Bee compared to the one used in this restaurant. As usual, there would be a braised dish in every restaurant’s 8-course menu. We had the Stewed Vegetables with Sea Cucumber & “Bai Ling” Mushrooms (海參白靈菇). Bai Ling Mushroom or scientifically known as Bai-ling Pleurotus Ferulse Lanze is a rare species of valuable edible mushroom which originates from the desert of northwest China. When these sliced mushrooms are being used in dishes, they resemble abalone slices. What we had was some broiled broccoli, sea cucumber, bai ling mushroom slices with added shitake mushrooms. The gravy was rather bland and the shitake mushroom had too much sugar added in the marinating process. What a waste indeed. The Pan Fried Prawns with Nutmeg Sauce (豆蔻爆大蝦) was quite tasty but some had that sandy texture, meaning that these prawns were not thawed properly prior to cooking. Moreover, the back of the prawns were not sliced at all, leaving us hell of a time trying to peel them with chopsticks. LOL! The Fried Seafood Ee-Fu Noodles was a laugh. It had barely a few strands of Chinese chives flowers (ku chai hua). Where are the rest of the vegetables? On top of that, it had some prawns and squid stir fried in minimal gravy and poured over the over soaked Ee-Fu noodles, with some deep fried onions garnished at the side. I won’t be serving this lazy way of cooking to my customers if I were to be the chef. The chef should have done something unique such as my ever favorite Gui Hua Mien (桂花麵). One thing you have to admit is that the restaurant sure has a unique recipe for dessert – Chef’s Specialty Dessert aka Blended Sweet Peach with Ice Cream (蜜桃冰淇淋). When everyone thought that it was the usual honeydew with sago dessert, but it turned out to be something different. In fact, the color was yellowish instead of greenish. The dessert had scoops of vanilla ice cream, blended sweet peach, sago with a light squeeze of lemon juice. Truly unique! Overall, I did not think that the dishes served here is valued for money, considering that I could have better quality and tastier dishes served elsewhere by paying only tens of ringgit more. Maybe they are still new and needed more time to accustom to the taste buds of the public. Let me try them out a few months from now to see if my verdict was wrong all the way. If you are coming from Komtar/Prangin Mall area through Jalan Burma towards Gurney Drive, drive until the Jalan Anson/Jalan Burma traffic lights (Giant Supermarket is on your right). Turn left into Jalan Anson, keep to your right and drive all the way up to the second right T-junction (Methodist Girls’ School is at the junction). Turn right into Jalan Logan and drive all the way to almost the end of the road and you would see the restaurant on your right within the compound of Loh Si Tong Chong Seah Clan House. The Specialists Centre (formerly known as Loh Guan Lye Hospital) is diagonally opposite the restaurant. Please also note that this restaurant is managed by the former major shareholder of Tian Tian Restaurant at Red Rock Hotel. 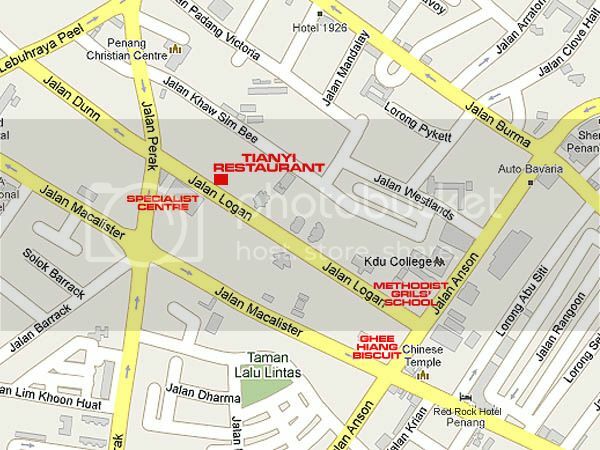 Address: 34 Jalan Logan, 10400 Penang, Malaysia. I saw in newspaper that one of their 股东 is from 天天。I wonder if the chefs are from there too? Yea… it did come out in the newspaper some time back. Hello! Aiyo.. not up to standard huh? Anything new in Pg to try nowadays? Not really. Have been rather busy packing and moving recently. Woww… RM588 nett is definitely not cheap. Even after converting to Aussie dollars… I’m not sure if I personally would pay for AUD 196 to feast on 8-courses… BUT with that said, even though the taste may not be up to standards, but I must admit these photos are making me incredibly homesick and I am craving a good 8-course feast right now!! 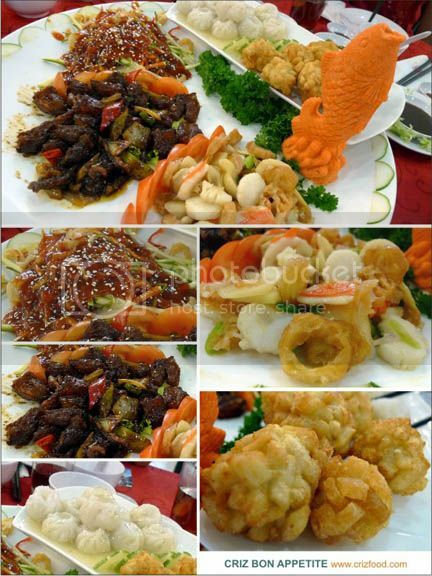 In Kuching (where I come from) we can probably get a decent 8-course meal for RM200++ … I think lah, lol. Haven’t lived in Kuching for 5 years, haha. Haha~ Maybe you can try them out a a later period when things get more settle down for them. Plan to have my father birthday dinner at here. As it was the 3rd day of Chinese New Year,just wonder if still got table or not. (3 table required). And have the menu list already come out for CNY promotion? How’s the price ? If able, can you pls send me the list of dishes for CNY? Thanks!